Perhaps the most severe side effect of radiation therapy is osteoradionecrosis (ORN), or bone death. This condition occurs in three to ten percent of patients. Osteoradionecrosis develops as irradiation diminishes the bone’s ability to withstand trauma and avoid infection, and it can be facilitated by poor nutrition and hygiene. This process may be spontaneous or result from trauma, leading to non-healing soft tissue and bone lesions, followed by bone necrosis. The non-healing bone may become secondarily infected. All patients who are to receive chemo-radiation therapy should have unsalvageable teeth removed, periodontal health maximized, and fluoride therapy instituted prior to treatment. 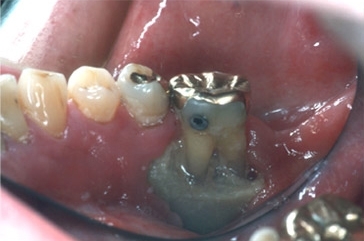 Osteoradionecrosis is an extremely serious complication for patients requiring tooth extraction after radiation therapy, and the risk does not appear to diminish with time (for the rest of his/her life the patient should never allow a dentist to extract a tooth after radiation therapy without consulting a radiation oncologist). The ability of the bony tissues to heal is compromised by hypovascularization. Essentially, the radiation destroys some of the very small blood vessels within the bone. These blood vessels carry both nutrients and oxygen to the living bone. A reduction in these vessels correlates to a reduction in the bone’s ability to heal itself. All patients who require extraction of teeth in a previously irradiated field should be considered at risk of developing osteoradionecrosis. The traumatic fracture of a maxillary bone or the mandible post treatment in an accident can also result in severe consequences. Such a problem when complicated by ORN, can cause massive destruction of the jawbones. Treatment for ORN may include hyperbaric oxygen treatments in which the bone is subjected to saturation with oxygen in a pressure chamber, not unlike those used to treat divers for the bends. When the severity of these post treatment ORN complications is considered, aggressive dental treatments such as extractions before radiation therapy become understandable. Hyperbaric oxygen therapy (HBO) was first proposed as a treatment for cancer and other conditions in the 1960s. At the time, research studies did not achieve any reproducible results, which engendered much skepticism among medical personnel. This skepticism even extended to HBO’s use in treating clinical conditions that it had previously been shown to help. It was not until the 1970’s that surgeons of the head and neck region came to recognize the value of hyperbaric oxygen in treating damage of the maxilla and mandible occurring during radiation treatments. Research into this therapy has since shown HBO to be effective when used in addition to conventional therapies for the prevention and treatment of osteoradionecrosis. There is also evidence to suggest that HBO may be helpful as a therapy for soft tissue injury caused by radiation, as well as restoring tissues and cells damaged by chemotherapy and radiation treatments. It has been in the field of treating osteoradionecrosis that hyperbaric oxygen therapy has seen some of its most dramatic successes. When osteoradionecrosis develops, tissue destruction devolves into breakdown of overlying tissues and symptomatic destruction of bone. During this process, the response to antibiotics can be poor. In many cases, the situation can be improved with the use of HBO therapy. Hyperbaric oxygen has been shown to be more effective than penicillin. Patients being treated with penicillin typically show a significantly higher rate of necrosis than those being treated with hyperbaric oxygen, with only five to thirty percent of patients able to expect remission of ORN through conservative therapy. HBO therapy is especially beneficial for high-risk patients, such as irradiated patients requiring tooth extraction. Hyperbaric treatment allows more oxygen to reach the damaged areas, and helps prevent tissues from dying from lack of blood and oxygen flow. The therapy is painless, and it is capable of producing a wide range of effects, including increased oxygen delivery to injured tissue, greater blood vessel formation, advanced wound healing, improved infection control, preservation of damaged tissue, elimination of toxic substances, and reduced effects from toxic substances. Hyperbaric oxygen therapy appears to assist in salvaging tissue damaged by radiation therapy by stimulating angioneogenesis in tissue that is even marginally viable. In reconstructive surgery involving irradiated tissue, HBO treatment prior to surgery can help promote a well-vascularized wound, enhancing healing and the reconstructive process. HBO therapy acts through both mechanical (pressure) and physiological (oxygen) components. Reports of early administration of hyperbaric oxygen, alone without appropriate aggressive surgical debridement, were disappointing, showing only an eight percent response rate. HBO was thus used as an adjunct to conservative therapy, and, in this new supportive role, showed excellent response rates. In a protocol developed by Marx, 58 patients received HBO treatments followed by debridement. All 58 patients studied had resolution of symptoms, with good results on long-term follow up, and others have now corroborated these results. Health care workers were able to deliver two to three times the amount of oxygen that can be provided by breathing 100% oxygen, as opposed to the twenty-one percent that we usually breath. This high-pressure dose of oxygen offers significant therapeutic benefits. Under such circumstances, repair of tissue damaged by high doses of ionizing radiation is facilitated. Hyperbaric oxygen therapy can be conducted in single person chambers, or in chambers that can hold more than a dozen people at a time. 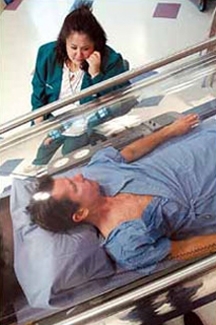 During therapy in a monoplace chamber, a single patient is placed in a pressurized clear, acrylic chamber, about seven feet long, while pure oxygen is compressed into the chamber. The chamber is comfortable, with an atmosphere similar to that of an airplane. The patient lies on a padded table that slides into the tube, and is asked to relax and breath normally as the chamber is gradually pressurized with pure oxygen. Chamber pressures typically rise to two-and-a-half times the normal atmospheric pressure. Ear popping or mild discomfort may be experienced, but this generally subsides if the pressure is lowered. The session can last anywhere from thirty minutes to two hours, at the end of which technicians slowly depressurize the chamber. Monoplace chambers cost less to operate than multiplace chambers and are relatively portable. Monoplace chambers are also far less expensive than their larger counterparts, a fact that has allowed hospitals to institute HBO programs more cost effectively. The internal environment of a monoplace chamber is maintained at 100% oxygen, so the patient does not need to wear a mask. Multiplace chambers are large tanks able to accommodate anywhere from two to fourteen people. These chambers are commonly built to reach pressures up to 6 atmospheres and have a chamber lock entry system that allows medical personnel to pass through without altering the pressure of the inner chamber. This system allows patients to be directly cared for by staff within the chamber. The chamber is filled with compressed air, and patients breathe 100% oxygen through a facemask, head hood, or endotracheal tube. Due to the high concentration of oxygen in both mono and multiplace chambers, fire hazards restrict the use of certain electronic equipment, but some monitors and ventilators with solid-state circuitry can be used within the chamber, allowing intensive care of critically ill patients. Hyperbaric oxygen therapy is a relatively safe treatment. If pressures within the chamber are kept below three times normal atmospheric pressure, and if sessions last no longer than two hours, complications can be minimized. At the end of an HBO session, patients often feel light headed and tired, but more serious problems can occur. Milder problems associated with HBO therapy include claustrophobia (in monoplace chambers), fatigue, and headache. More serious complications include myopia (short sightedness) that can last for weeks or months, sinus damage, ruptured middle ear, and lung damage. Oxygen toxicity, a major complication, can result in convulsions, fluid in the lungs, and even respiratory failure. These more severe complications are a result of central nervous system (CNS) toxicity. It is unusual under the accepted protocols, but if pure oxygen at three atmospheres were used for two to three hours, CNS toxicity would be produced in a large number of patients. Pulmonary toxicity is also uncommon when pneumocytes are allowed to recover from the toxic effects of oxygen. The most common problem during hyperbaric oxygen treatment is the failure of pressure to equalize on both sides of the eardrum, which results in squeezing of the delicate vessels of the eardrum, resulting in pain and bleeding into the middle ear. If the need for pressurization becomes urgent, pressure-equalizing tubes (myringotomies) may be employed. Mucous plugs, a further adverse effect, may develop in patients with congested sinuses, asthma, or obstructive airway disease, resulting in extreme pain. To combat this, patients with upper respiratory tract infection or congested mucous membranes are usually placed on prophylactic nasal or systemic decongestants prior to treatments. In the alveoli of the lungs, rupture may occur resulting in tension pneumothorax or, in severe cases, air embolism. This complication can be avoided by careful patient selection, HBO therapy is not appropriate for all people. Pregnant women should not be treated with hyperbaric oxygen. Hyperbaric chambers may also present a fire hazard; fires or explosions in hyperbaric chambers have caused about 80 deaths worldwide. The benefits of hyperbaric oxygen therapy are great, and despite the possible complications, in many cases its value greatly outweighs the risks associated with the treatment.